I was tagged 3 times all for different colors! It was fun to find them. Click to enlarge if you would like. 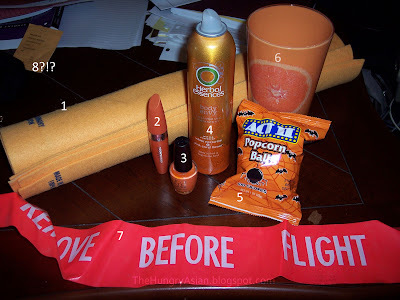 Kelliegonzo from Also Known As tagged me for orange! At the end I struggled as you can tell lol. 4. Herbal Essences volumizing hair spray. It smells nice. 6. I got a set of plastic glasses several years ago it has oranges, lemons, limes and grapefruits! 7. Remove Before Flight flag. This kind of looks non orange, but it's kind of florescent so it came out bright. 8. In the background as the little envelope that holds your dogtags, looks more orange than 7! Nicole from MagicMaid tagged me for green. She is killing me with the glitters she has! 1. Hello Kitty bling necklace. She is dangling in the center of the green blinged apple! 2. Grandpa's Wonder Pine Tar Toilet Soap. I have no idea. It was in the closet and has been there for at least 15 years. Had us giggling for a while. 3. Hard Candy nail polish in Envy. Untried still but not for long! 4. 2 dollar bill, nothing fancy. 6. Green apple Hello Kitty sucker. 7. English-Japanese electronic dictionary. I have a couple of these lying around. 2. A pink VooDoo Baby named Hell Kitty lol. Thanks Steve! 3. Pink nail buffing thingie. 4. Smashbox O-Gloss. Its clear and turns the right shade of pink (supposedly) for you. I don't quite know about that but I do like that it is non-sticky. My mother in laws HQ gloss! 5. I dream of sugar palette. It has eyeshadows, glosses, blush/bronzer. 7. I gave Alex his last birthday present in a pink bag that had that fabulous tag stuck on it. His voodoo baby is on it and hangs on his desk drawer! Thank you ladies for tagging me, I feel bad when I have to pick names and leave others out so I will opt out this time. If anyone is game to do one tho I pick purple! Ah fun tag! Sham Wow!! 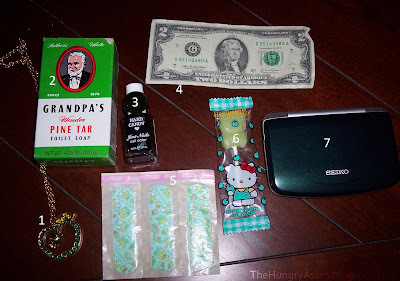 LOL Love the Keropi band aids. 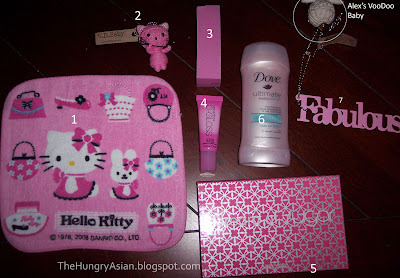 What cute Hello Kitty items you have. The money is the best of all greens! Haha...You're just as much of an enabler as I am!